Labour Weekend is almost upon us and we hope that you'll be getting to spend it in our beautiful part of the world. This is the time of the year when things start to get busy around here, so let's cross our fingers for fine weather and hordes of happy people getting along with each other and enjoying the Kuaotunu lifestyle! The Kuaotunu Hall Committee is pleased to invite you to its Annual General Meeting which is being held at the Kuaotunu Hall on Saturday 21 October at 3pm. This is the annual opportunity for the members of the Committee to update you on the projects which they have been working on during the last financial year (of which the fabulous new floor was obviously the major one) - and to let you know about projects planned for the current year. Once the formalities are over, the Committee would like to invite you to linger a while to enjoy a cup of tea/coffee and cake. So if you haven't had the opportunity to check out the new hall floor yet, here's your chance! You are welcome to come to either the AGM at 3pm, the afternoon tea at 4pm, or both. See you there! Fancy Some Fresh Fruit this Summer? 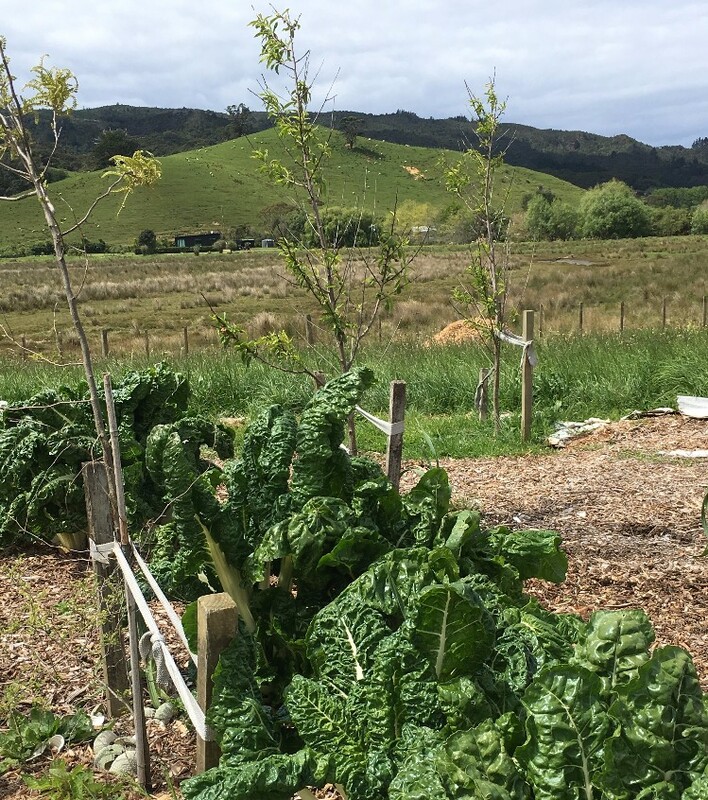 Thanks to the hard work of many Kuaotunu locals the Food Forest (located behind the sports ground and tennis courts) is growing strongly, and local champion Peace Bianchi is hopeful that there may even be pears and peaches this summer, along with heaps of greens and summer veg. The aim of the project is to "grow unity in the community", and like all community projects, both hard work and financial contributions are required to make it a success. The most pressing need at the moment is for money to fund the tree planting programme. If you would like to contribute you can visit Colin and Claire at Waitaia Nursery to buy a tree or two for the project, or simply make a donation directly to Waitaia Nursery's bank account (02-0496-0015061-00) with the reference "Food Forest". The project team would also appreciate extra hands to help with weeding between the fruit trees, and any donations of spare seedlings, or seeds to spread to suppress weeds. Contact Peace directly on 021 0820 8577 if you would like any further information. And if you happen to have a walk-behind rotary hoe that the project could borrow temporarily, Peace would love to hear from you! The Harbour Master has offered to put six 200m marker buoys to make it clear where the 5 knot speed restriction begins and ends. We are hoping these will be in place shortly. After several years of hosting the annual DOC Kiwi Aversion Training sessions in Kuaotunu, Sheila Westley has undertaken training to become a registered trainer and run these courses herself. This has been achieved through the Project Kiwi Trust, DOC and Kiwis for Kiwi all working collaboratively to help our precious kiwi thrive. The number of kiwi in this area is growing steadily due to the knowledge and dedication of the Project Kiwi Trust and its many volunteers. This is why it is so important to spread the word and get as many of our dogs (both pets and working dogs) to attend these sessions and support the Trust's hard work. The sessions take approximately 10 minutes per dog and they are free. To book one of these sessions, or to register your interest in future sessions, please email Sheila at avertmydog@projectkiwi.org.nz or text her on 021 716514 with the number of dogs to be trained and she will confirm the time and venue. These training sessions endeavour (with the aid of props) to avert your dog from wanting to go near the sight or smell of kiwi. However this method is not a silver bullet, so when walking in the bush please ensure your dog is on a leash - and inside or secured at night. If you are a dog owner who studiously avoids bush areas to ensure your dog doesn't chase and kill kiwis, then you probably think - hooray! dogs love beaches and we have some of the best right here! Yes we do, and for the majority of the year dogs can roam freely on our beaches. However at this time of the year the dotterels start breeding, and not appearing to be particularly bright they tend to build their nests very close to the high-tide line... just where dogs love to roam and play. So please be aware that this is dotterel breeding season, and you will see signs and some fenced off areas on the beach indicating that dotterels are nesting in that area. Unfortunately your dog can't read signs, and just by inadvertently running through a nesting site they may accidentally crush a nest and/or chicks, or disturb the parent birds leading to the death of their chicks. Unfortunately it's not only dotterels that are at risk from dogs - Kuaotunu is fortunate to also have little blue penguins who call our beaches home (hence the new penguins signs on SH25) and they often nest in the dunes. It's therefore vitally important to remember at all times that you are responsible for your dog's actions on our beaches. 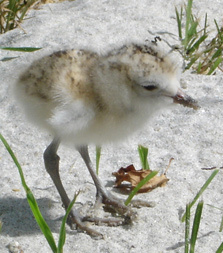 If you are not confident that you can keep your dog within 20 metres of you when walking along the beach in an "off leash" area, please put them on a leash - especially when close to dotterel breeding areas. And if possible discourage your dog from chasing seagulls, as doing this encourages them to chase any bird that runs, e.g. dotterels. Our birds thank you in advance for your cooperation! Come along next Saturday evening and listen to conversations Leigh Cunningham has with artists Michael Smithers & Phil Fickling, authors Trish Gibben, Des Hunt and Isabel Gilbert Palmer, photographers Flea Witters, Ian Preece and Gabrielle McKone, poet Dr Olivia McCassey, spiritualist Verna Carr, and librarian/songwriter Stewart Pedley. Then enjoy mingling with these talented professionals afterwards over snacks and refreshments. This is a fundraising event for the new Kuaotunu library. Dig Out Those Old Photos! The Hall Committee is looking for old photos of functions at the hall to feature on the new website it is developing. The hall has been used for so many gatherings over the years and we are keen to feature some of the earlier ones on our History page. So if you have any old photos of weddings, dances, birthday parties, community events etc at the hall that are in good enough condition to be scanned, please email us at kuaotunuhall@gmail.com to let us know. We can't promise that all photos will be used but it would be great to have a good selection to choose from, so that we can keep our History page interesting. Get ready to dance the night away at the 1940s dance party on Saturday 11 November at 7:30pm. This is a fundraiser for the Kuaotunu Hall that Jannine Verner is kindly organising. What better way to break in the hall's new floor! Tickets are on sale now at Luke's Kitchen - $20 (cash only). BYO liquid refreshments and a supper plate.